Here is a favorite in my collection. This is a faceted beryl from Minas Gerais, Brazil, weighing 119.23 carats. It measures 4 cm in length. 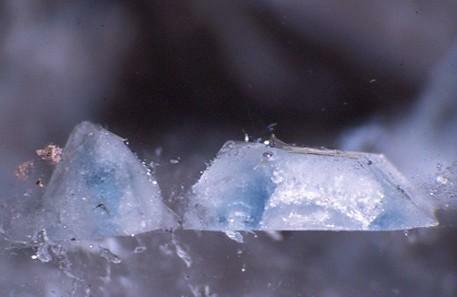 What is wonderful about this beryl is that it contains one of the best and most dramatic screw dislocations that I have ever seen. 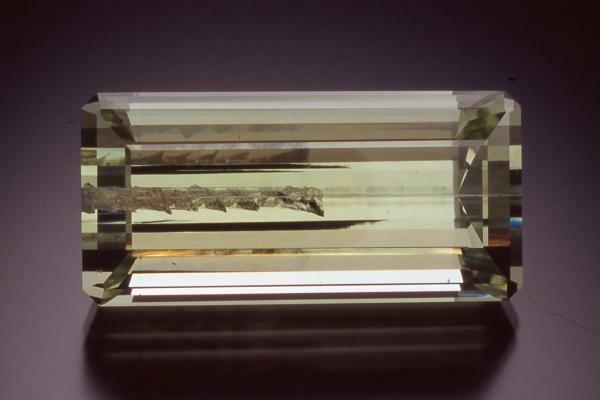 I bought a large crystal with this inclusion in Tucson in 2006 and had it cut by Michael Gray into this lovely gem. Those of you who are opposed to the cutting up of crystals should know that this one was badly damaged and of very little value as a specimen. I would never consider cutting a fine crystal specimen. An article about this gem can be found in Jewelry Artist, December 2008, pp. 53-55. I am sharing this with readers of this Forum in part because of my friend Jordi's unreasonable aversion to all things cut and polished in the mineral world! I agree completely with Jordi and his "Puagghhh!". But setting this jewel aside, I guess you must have a great collection. Please, take the patience of posting it here, piece a piece, for all of us to look at them. I think it is a lovely gem. 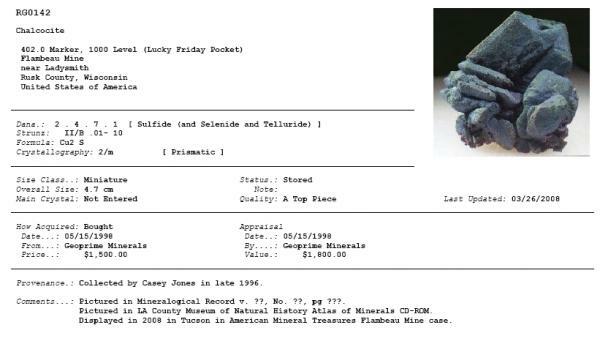 A fine gem collection enhances a mineral collection. One of my favorite collections is the JP Morgan diamond collection housed in New York. Of course my gem collection is set in gold and hangs from my ears - one of the pleasures of being a "woman collector". John, how fascinating and beautiful, thanks for sharing! There will be an article about my single crystal collection coming up soon in Mineralogical Record. Of course this is just one type of what I collect, will try to provide some photos of other things but don't want to pre-empt the MR article. That is so cool. I will look forward to that. Before I became interested in mineral collecting I was a "rock butcher" or lapidary. Hey, some minerals, such as agates, can only be cut to bring out their inner beauty, much like thundereggs, geodes, etc. Okay, I can’t resist a little teaser. In addition to my single crystal collection, I also collect quartz. 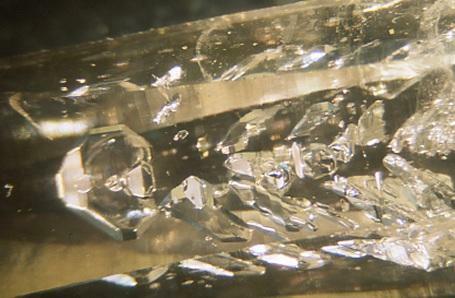 I especially like quartzes that have some interesting feature, such as inclusions. This is one of my favorite, and is from Meigu, Liangshan, Sichuan, China. These “nails” in quartz are hematite and they measure about 1 mm in length. My interpretation of what has happened here is that the red stems consist of finely dispersed hematite and they grew at the same rate as the quartz which encloses them. Then, the quartz ceased growing, allowing the hematite to form caps. After this the quartz resumed growing and completely enclosed the “nails.” This photo was taken through a natural crystal face, the piece has not been cut and polished. The caps are black because they are denser than the stems. We all know, of course, that hematite is actually red when it is very thin or powdered. Thanks for sharing John, looking forward to the article! Very cool. 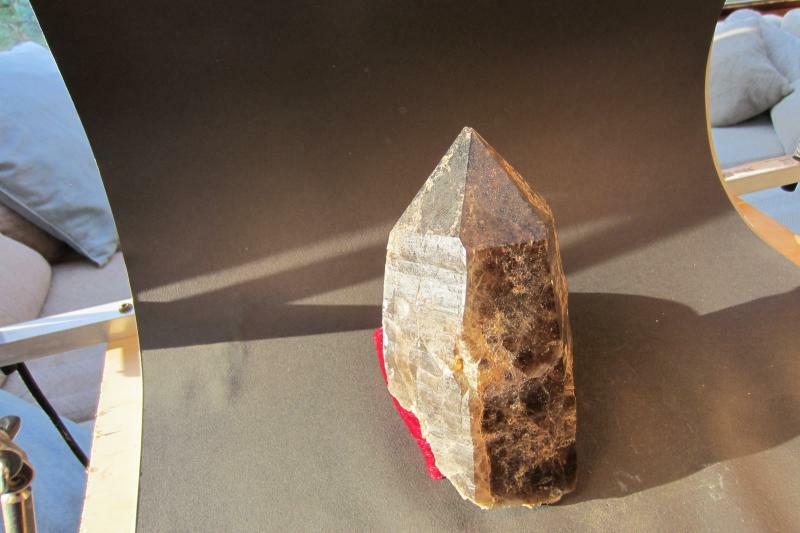 Quartz is one of the most under-appreciated minerals. Thanks for sharing that really unique photo and story behind it. I too really find quartz a fascinating mineral to collect. It certainly is not boring, is it? I will look forward to the Min Rec article. Of course I look forward to every Min Rec anyway. Thanks again John. At Jordi's urging I am going to post some more photos of pieces from my quartz collection. I believe I posted a very poor photo of this one already, this is a much better photo. 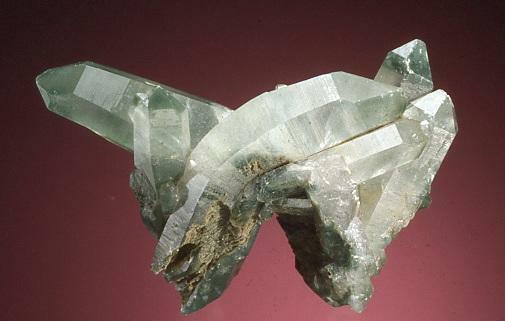 This curved quartz with light chlorite inclusions is from the Chivor mine, Colombia and it measures almost 7 cm across. Jeff Scovil photo. This is a "sleeper" amethyst that I bought at this past Tucson Show. It was originally very large but I had it trimmed to a smaller size, now about 10 cm across. The "buttons" are calcite, but I have no idea what caused them to form this way. It is from Rio Grande do Sul, Brazil. 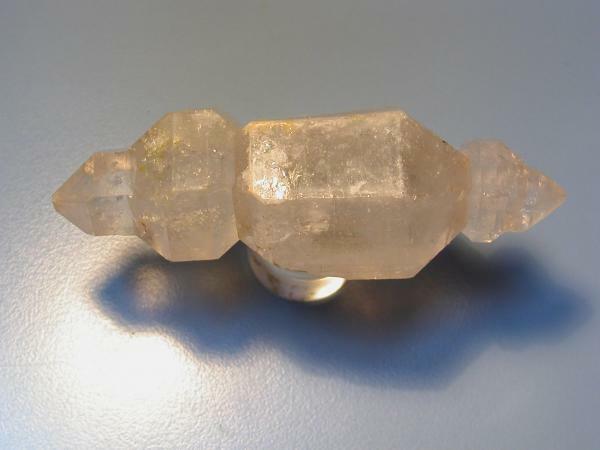 This is a cute little quartz from Leshan, Sichuan, China, sorry about the less that elegant photo. It is 7.5 cm in length. I was really pleased to find this jewel in a flat of more or less ordinary quartz crystals. For those of you who like to speculate on how scepters form, this is a real challenge. I call these "head scratchers" because they are difficult to understand, and I particularly like "head scratchers." You will find many of them in my collection. Among my many quartz specimens you will find many examples of crystals with interesting inclusions, such as this one. 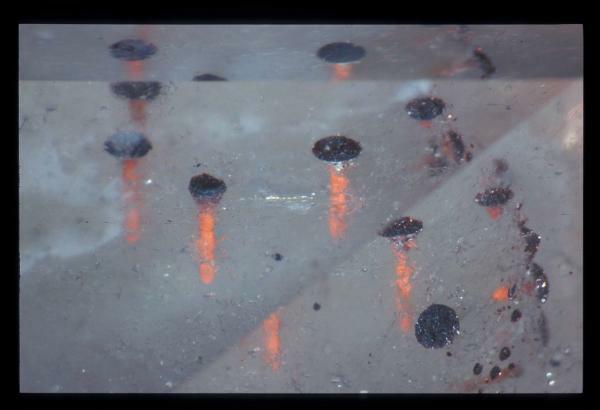 This is a portion of a crystal from Amatitlan, Guerrero, Mexico, and it has these wonderful oriented empty holes, which mineralogists often refer to as negative crystals. 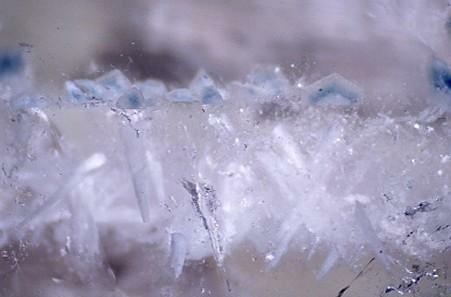 The entire crystal is 4 cm long. The photo was taken by Russell Feather of the Smithsonian Institution. WOW! I whish I got your skills to trim the ametist! The piece you produced is really beautifull, and I could not imagine it seeing the big one you. Nature produces wonderful pieces, but man also helps to display them in full beauty! The multi sceptered quartz is indeed very curious. As you said, a head scratcher! But my prefered is still your curved quartz! I still remember the talking we all had in Forum about the genesis of such curvature. And I still have the sweet flavour of your Mont St. Hilaire rhodo....! If anytime you decide to look for another home for her, you know :-)! May I dare to ask you to share more pieces? Thank you Lluis for your kind words. I really enjoy showing my collection to visitors, so the Forum offers a new way for me to share it with more people. That is part of what makes collecting so rewarding. This piece is a section of polished quartz from Rio Grande do Norte, Brazil. Because it is polished Jordi would hate it. The polished surface is 5 by 3 cm. 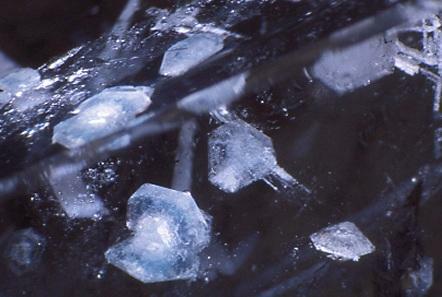 Within it one can see a zone of white bladed cookeite crystals over which is a zone of space-ship-shaped flat apatite crystals that are blue with white centers. I wall attach a couple of photos. Those photos were all by Russell Feather.